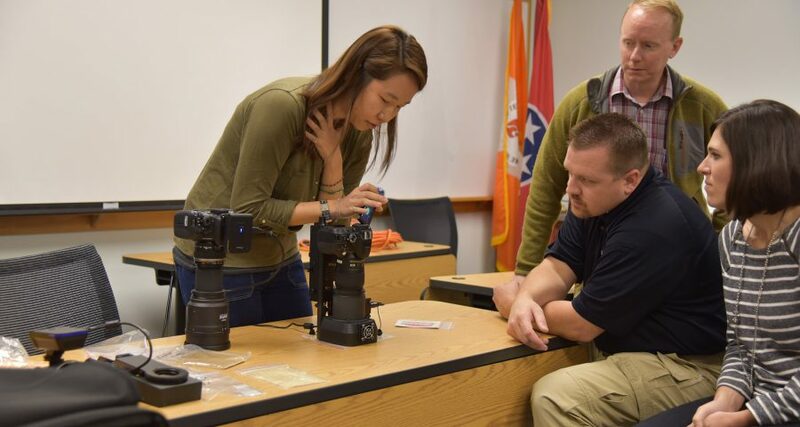 As an integral component of the University of Tennessee Institute for Public Service’s Law Enforcement Innovation Center (LEIC), the National Forensic Academy (NFA) continually endeavors to provide the most up-to-date information and technology to the nation’s crime scene investigators. The NFA recently acquired several cutting-edge Fuji infrared (IR) cameras. Thanks to the recent generosity of Lumos Technology, Ltd., a forensics equipment company located in Taiwan, these state-of-the art cameras will be supplemented by two advanced photographic enhancement systems donated to the NFA by the company. Four members of Lumos Technology recently made the long journey from Taiwan to Oak Ridge to present the systems and to discuss their capabilities and potential benefit to crime scene investigators. Greeted by NFA Consultant Dan Anselment and LEIC Program Manager Jeff Lindsey, members of the Lumos Team toured the LEIC and NFA facilities prior to their presentation and demonstration of the new equipment. “The two systems donated to the NFA will be beneficial to the practical hands-on training that participants receive here at the NFA,” Anselment said. One of the systems, the X-Loupe ForteLite, will be used primarily to aid in the recovery and documentation of latent fingerprints utilizing IR light and IR fingerprint powders. This allows the investigator to cancel out the busy background often noticeable behind a fingerprint and provide more clarity to the print itself. For example, the investigator will be able to erase the background behind a latent print discovered on a piece of U.S. currency and leave only the fingerprint visible for future comparison to other prints by a latent print examiner. The second system, the X-Loupe AgileLite, is a photographic device with a built-in alternate light source. This alternate light source in the device enables the investigator to take clearer digital images of enhanced latent prints processed with dye stains or images of bodily fluid stains for future comparison, analysis, and documentation. In its quest to remain a cutting-edge training entity, the NFA is both fortunate and grateful to benefit from the generosity of organizations such as Lumos Technology. This generosity enables the NFA to provide students access and experience with today’s innovative forensic science technology.